Besides offering easily veganized drinks, Peet's also introduced a yummy dairy-free coconut whip topping last summer, which they offer year-round. I couldn't wait to try it on my vegan PSL! 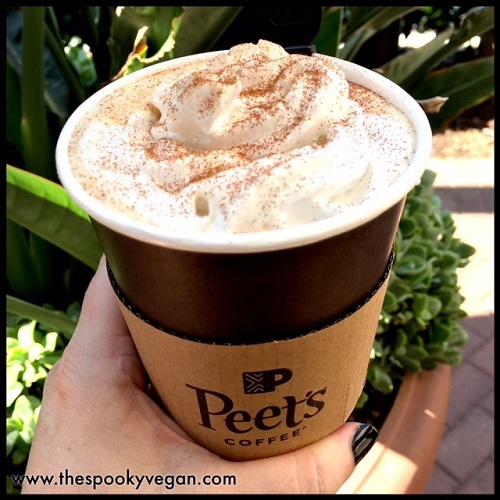 They started offering their pumpkin spice lattes at the end of August, so last Friday when I checked out Roger's Gardens' Halloween displays I popped by my local Peet's and ordered my own piping hot PSL (even though it was 100 degrees out - note to self, get it iced next time!). On their drink menu board, the non-dairy pumpkin spice latte is clearly identified. You state you want that, then you can choose between soy, almond, or coconut milk for the non-dairy milk base. I choose coconut! I also added their whipped coconut topping, which is extra. To my surprise, they also had a vegan muffin option, so I got that as well (nom nom nom). dusted with a bit of cinnamon - totally dairy-free and totally vegan! I got my drink (after verifying with the barista that it was all vegan, just because I'm paranoid like that! ), topped it with a sprinkle of cinnamon, and enjoyed a sip of heaven! I drink a lot of coffee, but it is usually straight up black coffee, so sipping this fragrant, sweet, creamy and pumpkin-spicy drink was a real treat! Even though it was sweltering hot outside, I really wanted to kick off the Halloweenie season with this hot drink and pretend there was a fall chill in the air, haha! I can't wait to try it iced next time! The drink is only available August 30th - October 31st, 2017, so get it while it lasts! I really wish they would extend it so it is available through Thanksgiving, but I'll take what I can get. 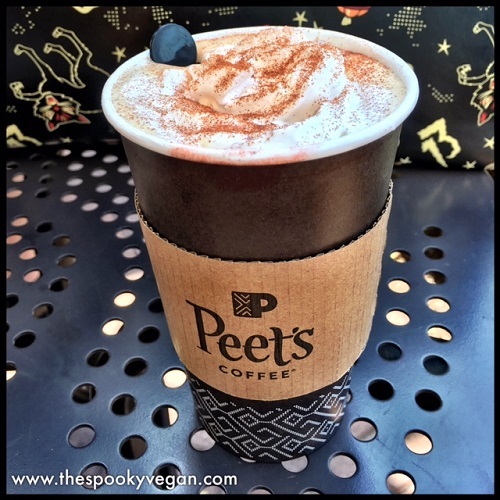 Have you tried Peet's non-dairy pumpkin spice latte? Do you love it as much as I do?! And for those curious about ditching dairy, do it! It's easy (way easier than you think! ), you will be way better off without it (seriously, your body will thank you), you'll be helping the environment, and saving animals. There is a wealth of information out there about the benefits of going dairy-free - here is a quick guideline on going dairy-free from Vegan.com! If you are interested in going dairy-free (or vegan for that matter), please feel free to reach out to me with any questions you may have - I'm happy to help!